Located on the west side of the picturesque Bitterroot Valley, just outside of Victor, Montana, sits this extremely private and elegant Montana property. A beautiful custom home overlooks irrigated pasture land that surrounds a lush riparian corridor formed by Gash Creek. In the distance, spectacular views of the Sapphire and Bitterroot ranges will never get old. 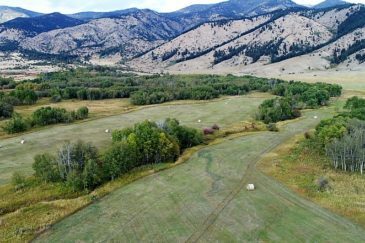 This Montana ranch for sale is very close to the Bitterroot National Forest and serves as refuge for numerous species of wildlife, particularly the Rocky Mountain Elk that enjoy both the green grass of spring and the surrounding area’s quality habitat. Wapiti Ranch makes an exceptional private retreat for an absentee owner and could easily serve as a year-round residence if desired. The home is truly unique; a work of art , its architectural design exudes a western flare that is quintessential Montana. This cozy setting offers dramatic views, peace and quiet, and its position in the Bitterroot Valley offers easy access to everything found in one of the most desirable areas of western Montana. Find out more about this Western Montana Ranch For Sale when you download the property brochure.